The trendy dessert is all about excess. There should be occasions invented for brick toast. Shibuya honey toast goes by various names and has predictably made outsized splashes in cafés and tea shops in Japan, Singapore, and Taiwan, but under any name it’s magnificently outrageous. A block of brioche or sandwich bread whose insides have been carefully carved out in tidy cubes, baked in melted butter and honey, and then stuffed back inside with whatever fantasy toppings are at hand, fruit, cookies, almonds, and always ice cream, mounded up into a Matterhorn of childlike whimsy. If you have not gathered a party for brick toast, I suggest you make a date for Snowflake Café, tucked into a tiny strip in Richardson. They’ll give you what you want: those big, golden croutons, baked in butter and honey. They’re ridiculously good, slightly crispy-crunchy and already based on a rather lovely brioche-like egg bread. You can anticipate the arrival of your order. The place starts to smell of toasted bread, sweetness, and warm delight. By the time your number is called, it’s become irresistible, and someone jumps up and triumphantly hauls back the cargo to the table with a handful of plastic knives and forks, and I suppose the correct response would be, “Surprise!” Because no one has seen something so impossibly, architecturally stupendous that seems, for the most part, intended for adults. 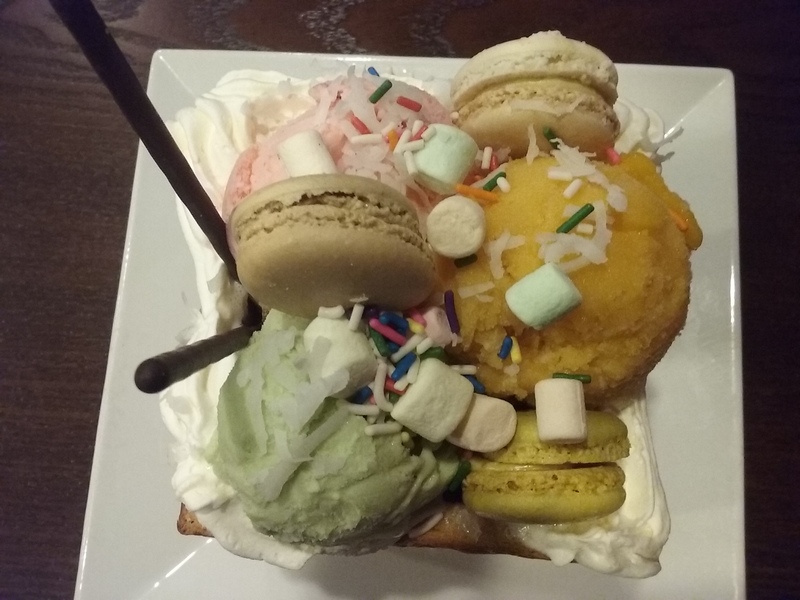 On Snowflake Cafe’s menu, the macaron party honey toast sounded the most fanciful and frivolous. Matcha and red bean: utterly classic. Summer delight with kiwis, strawberries, etc. : fresh and almost healthy. Macaron party? A glacier of mango, green tea, and strawberry ice creams (you choose your three flavors) topped with macarons, whipped cream, pastel-colored mini marshmallows, rainbow sprinkles, and a couple of Pocky sticks for good measure. Why not? The menu itself is a Tetris involving the words “snow,” “milk,” “ice,” and variations thereon. Shaved milk. Milk snow. Snow ice. There is the ultra-popular rolled ice cream, scraped and shaved into perfect rolls. And crepe cake slices, for which you can choose the crepe flavor, to be layered like a millefeuille with ice cream. One version of the honey toast involves teriyaki chicken. I think it’s always a good time for a macaron party.